"Books on Books" and the Phenomenon #1 Indie Next Pick "Hothouse" for August, On Sale Tuesday, August 6. There’s a little section in our store called “books on books” which we, and before us, Schwartz have had for a number of years. Previous to that, this kind of title was folded into literary criticism or biography, or sometimes reference. The subject can be about book design, booksellers (one of David Schwartz’s favorites was Sunwise Turn), or even a memoir that is about reading a whole mess of books in a year. I used to be a bit obsessive about this section and as a buyer, I probably would have put The End of Your Life Book Club here, after it had its run of front of store, staff rec, and book club table (it’s currently one of our book club picks, and featured in the brochure), instead of the biography section where we currently have it. Though I was not as anti-biography section as the late Borders, I still wasn’t crazy about it for memoirs, although I did accept it for historical figures when another section (sports, music) didn’t make more sense. But I’m not moving it or anything, as I am reminded of the longtime bookseller I worked with whose quirk was demanding that every book she liked written by a woman should be in women’s studies. That said, these books on books are the kind of titles that work great in indie bookstores and I’d often have great success featuring them in our Schwartz newsletter. They didn’t work very well in other markets, sort of the way a Wisconsin interest store wouldn’t sell well in Missouri. I think of this because of the release of Boris Kachka’s new Hothouse: The Art of Survival andthe Survival of Art at America’s Most Celebrated Publishing House, FarrarStraus and Giroux. To my knowledge, Simon and Schuster did not do a mass-mailing of advance copies to bookstores. 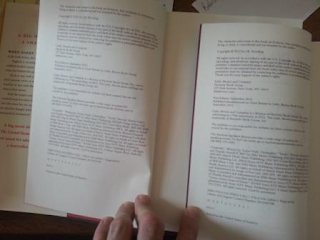 Instead, they did a targeted distribution of print-on-demand, tape-bound galleys along with a note from the editor. But this is the thing about these kinds of books. It seemed like just about everybody who got a copy read it, and liked it enough to get it to the #1 pickon the American Booksellers’ Association Indie Next List for August. Let me just say that this kind of percentage is very unusual. I am one of those people, of course. How could I not be interested in the story of FSG, responsible for the careers of many of the great writers of the 20th century, a house that one could say hoarded Nobel prize winners. The stories that Kachka tells in his exhaustively researched story are fascinating or delicious, depending on whether you are focusing on nurturing, advances, successes and failures of the house, or the peccadilloes (this word somehow came to me and I was shocked when I looked it up that it was actually being used correctly) of the participants. This sort of high-low gossip reminded me a bit of The Devil in the White City’s “come for the urban planning history, stay for the true crime” sort of dichotomy. I could have done without the who slept with whom and how who got fired, especially when a lot of these folks are still around, but I understand that this really puts the story in a cultural context. Here’s what I sent to the publisher after I read the book. It’s a little too long for a rec; there’s also a shorter version somewhere, but it explains what I liked. “The family business may have been American Smelting and Refining (ASARCO), but for Roger W. Straus, starting a publishing company was the perfect mix of business and culture. Having started the eponymous company with John Farrar, an acclaimed editor recently pushed out of another family publishing business. The independent presses were legion in those days, and many of them boasted authors of note. But upstart Farrar, Straus (the third name rotated out like an accounting partnership until Robert Giroux came aboard), their mission was to carry the intellectual torch while outlasting everyone else. “Of course the mission sometimes included at least one bestselling celebrity memoir, a diet book, and a series of commercial thrillers, but if I’ve learned one thing from a family business, it’s that there’s always going to be some contradictions. The company boasted an international lineup that included a streak of ten Nobel prizewinners in an 18 year period, and raised the profile of many a Jewish and Catholic writer. Reading Hothouse is a great introduction to 20th century publishing, but even someone well versed in the subject will find many insights into everything from new journalism to the shockingly sexual office politics of an earlier day. Recently Chuck Klosterman stated that in his opinion, you can’t plagiarize yourself, but wasn’t that one of the 17 things that got Jonah Lehrer in trouble? Here’s the thing-if he had only reused ideas (and exact language) in multiple columns, would that have been enough to lose his appointments and contracts? I don’t know, because he did lots of other things too. I’m also not being paid for any of this, so there’s not the presumption of me recycling old work. But just in case, I put that recommendation in quotes from myself. Let me emphasize that Hothouse really was a fascinating look at leadership transition at a small business. I was just talking to a friend in the consumer food business, who formerly worked in the grocery business, and we had a fascinating discussion about exit strategies. It depends how big you are, how you get your capital, and whether you are really making enough money to be sustained, or instead making money through growth. One of FSG’s biggest problems was their success in the 1980s with Tom Wolfe and Scott Turow. It brought them into the big leagues, and the small advances they paid previously weren’t cutting it when writers saw fellow authors being paid big bucks. There are no end of cautionary tales (The Time Traveler’s Wife comes immediately to mind) about a publisher strained by their success. 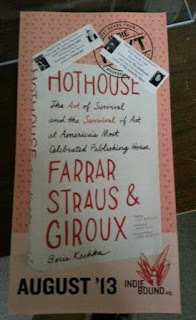 "Hothouse has both intelligence and wit in its revelations of publishing, publishers, and the capture of authors. The story of FSG is a dazzling, wide-lens view of decades of literary America. To call Boris Kachka's prose 'brilliant' is not a cliche, it has meaning." "This is an amazing, once-in-a-lifetime book. With Hothouse Kachka has produced his very own Mad Men for the literary world--an exhilarating, beautifully written biography of FSG that's really an exhilarating, beautifully written biography of a literary culture." So maybe if I were another kind of store, I might put this in biography, history, or even business. But for me, this is a “books on books” kind of book, through and through, at least after it works our way through the new releases and my staff rec shelf. New and Noteworthy Fiction From Andrea Barrett, Mark Slouka, Alexander Maksik, Natsuo Kirino, and Jenni Fagan. We're one step closer to fall, and that means a nice assortment of new fiction to enjoy. Andrea Barrett's new collection of fictions (I think that means stories) is Archangel (Norton). In these five fictons rich with fact, the publisher notes that Barrett explores the thrill and sense of loss that comes with scientific progress. Whether she's playing off of Darwin's theory of evolution, the theory of relativity, or the 20th the developments in genetics and x-ray technology, Barrett, as Valerie Ryan in Shelf Awareness notes, "combines fact and fiction in scenarios that bring the reader to a better understanding of the high cost, both personal and public, of scientific advances. For all that is gained, a great deal is lost: reputations, long-held beliefs, years of research. Her own scientific knowledge illuminates these complex questions and discoveries without sacrificing character or story." Because W.W. Norton uses pub dates instead of on-sale dates, there are no to the moment trade reviews that I'm able to find using a search engine. Compare that to Alexander Maksik's A Marker to Measure Drift (Knopf) where there's already a Boston Globe review from former Granta editor John Freeman, who praises Maksik's effort to bring "a moving dignity" to this tale of a homeless Liberian woman in Greece and Africa. The publisher notes that the story is visceral and gripping, and contemplates ruin and faith, barbarism and love, and the devastating memories that contant the power both to destory us and redeem us. If you want a little noir with your women's journey to awareness, try Natsuo Kirino's The Goddess Chronicle (Canongate), a slice of Japanese feminist noir of two sisters from a family of Oracles. Kaminkuu is admired for her beauty, while Namima lives in her sister's shadow, per the publisher. One nice thing about a book that's an American reprint is that the reviews are all there, ready to be linked. It seems that the Guardian seems to review every literary novel published in the UK, and this time, Tai Twan Eng reports "Kirino is a master at creating an atmosphere of unease and distrust between her characters. In her skilful hands we see that the divide between man and woman is greater than the one between humans and gods." Mark Slouka is American and from W.W. Norton, which because they do pub date as noted above, won't have trade reviews yet. I bet they will be good, however, as there is a lot of good advance word on Brewster. I see he's touring to at least Northshire and Brookline Booksmith, so here's hoping those esteemed booksellers will continue the buzz. The new novel is a departure from his World War I set previous novel, with the newest being the story of four teens in 1968, set in the town where Slouka himself grew up. Publishers Weekly gave it a starred review, noting "Slouka’s laconic dialogue resonates with regional authenticity, his late-1960s pop culture references ring true, and the stripped-down prose style in his masterful coming-of-age novel recalls the likes of Tobias Wolff and Raymond Carver." But it appears the real outgrowth of on-sale dates is that Michiko Kakutani can set the tone by reviewing books in The New York Times over a week before the book's arrival. Is this because they don't care, or to show how important they are, or to mark the fates of the chosen. When it's a good review, who cares, and in the case of The Panopticon (Hogarth), by Jenni Fagan, it is good indeed. It's the story of a young woman set in Scotland's foster care system, a genre that seems to have bubbled to prominence, with the huge success of Vanessa Diffenbaugh's The Language of Flowers and Susan Nussbaum's Bellwether Prize winning Good Kings Bad Kings (at Boswell on August 8, 6 pm). Kakutani called the novel "fierce" at the beginning and "genuinely felt and deeply affecing" at the end, so even though she quibbles in the middle, that's a review that was meant to be perceived as positive. I've complained in the past about reviews that are cranky at the beginning and end but positive in the middle---this is sort of the opposite. The Panopticon came out last week, but I had nothing else to group it with. That shouldn't be a problem going forward. August 6 is a big on-sale week. All titles listed, by the by, are Boswell's Best through Monday, August 5. Monday Event Post--Craig Wilson, Find Waldo Local Wrap and Brain Quest Challenge, and Michael Zummo. Craig M. Wilson is Madison-based, award-winning photographer and kite enthusiast. Many of his kites are hand-sewn and he has taken part in kite festivals worldwide. A Little More Line is a new collection of aerial photography from the kite-flying photojournalist behind Hanging by a Thread, capturing unique perspectives in full-color. In addition to continuing to show Wisconsin in a fresh and magical way that only a kite can, A Little More Line also drifts across our state’s borders. Discover new ways of seeing places like the Milwaukee Art Museum, Frank Lloyd Wright's Taliesen, Door County, Apostle Islands, Chicago's Millenium Park, Michigan’s Mackinac Island, Iowa's Field of Dreams, Duluth's shipping harbor, and more. In between the taxidermy segements, here's Craig Wilson on the public television show Outdoor Wisconsin. Find Waldo Local and Brain Quest Challenge. We'll be wrapping up our great month of Find Waldo Local Milwaukee, with a drawing for the great prizes from retailers Fischbergers, Cafe Hollander, Yo Mama, Indulgence Chocolatiers (two), Zoom Room, Just Kidding Kids Cuts, Boswell (ten $10 gift cards), and the grand prize, a boxed collection of hardcover Waldo books. As part of our celebration, at 4:30, we'll be hosting the Brain Quest Challenge, a great activity for kids 4-12. Based on the Brain Quest game, our Brain Quest refs will split kids into two teams, and each kid will get to answer age-appropriate questions in a fun and exciting program. All attendees will get prizes. And yes, there will be snacks, sponsored by Outpost Natural Foods. Milwaukee-based developer and programmer Michael Zummo takes a departure from his present world of interactive storytelling and web-based game creation for that of classic science fiction. While D'Mok Revival: Awakening is his first novel, he has been a storyteller since her created his first game, The Great Beyond, in high school. Millenia ago, the Nukari eradicated the ancient space-exploring D’mar race. In spite of his immense efforts and superhuman abilities, not even D’mok, the greatest of the D’mar warriors, could stop the annihilation of his people. Now, the Nukari’s attack on the fledgling human coalition leaves a space station destroyed and one lone survivor. Haunted by grief for his murdered family even as unexpected D’mok-like powers awaken within him, Rhysus Mencari finds himself thrust into alien territory. ReShonda Tate Billingsley, author of A Family Affair. This event is co-sponsored by the Milwaukee Public Library and V100.7, WKKV. NAACP Award-winner Billingsley, whose bestselling fiction "tackles some of life's toughest situations" (The Florida Times Union), unravels the secrets in a mother's past that turn her daughter's life upside down—by revealing the family she never knew existed. Billingsley’s #1 bestselling novels include the NAACP Image Award winner Say Amen, Again, and Let the Church Say Amen, soon to be a BET original movie. Her new novel is A Family Affair, on sale this Tuesday, July 30. Her dream of studying dance at Juilliard is within reach, but Olivia Dawson turns down the opportunity, choosing instead to stay with her ailing mother in the Houston projects where they barely make ends meet. Lorraine Dawson is Olivia's whole world, and now Olivia insists on being there for her. But when Lorraine learns Olivia is sacrificing college for her sake, she reveals a secret: Olivia’s father, Bernard, isn’t dead, but alive and doing very well for himself in Los Angeles where he lives with a wife and son. When Olivia’s mother succumbs to her ailments, she sees no other choice but to track down the man that might be her father, and confront him about the lifelong deception. Opening up the past, however, is more complicated than Olivia—or Bernard—expected, and the pain of yesterday's sins must be confronted before true healing and a bright tomorrow can begin. Sunday Bestseller Post--Fresh Air Boosts David Gilbert and Reza Aslan, Event Wrap Ups With Barbara Shapiro and Maddie, Book Clubs Reading Lauren Binet, Laura Moriarty and More. Here's how things sold this week at Boswell. As you can see, our order for The Cuckoo's Calling came in. I'm not exactly sure what caused the pop in Neil Gaiman, which has been selling well since release nationally but had fallen off with us a bit. But the pop of the week is David Gilbert's And Sons, which had a great interview on Fresh Air earlier in the week. I'm remiss--I was supposed to read it but I wound up giving my copy to my sister Merrill, who, by the way, loved it! It's a novel that spins off a Salinger-esque character's passing Advance reviews were amazing. Booklist wrote "Gilbert's delectably mordant and incisive tragicomedy of fathers, sons, and brothers, privilege and betrayal, celebrity and obscurity, ingeniously and judiciously maps the interface between truth and fiction, life and art." The top sellers are a with a mix of past, present, and upcomiing events (with some non-event seasoning like Packer and Aslan), including signed-copy sales of Chuck Klosterman's latest. Reza Aslan's new book was also kicked off with a strong Fresh Air interview. But the highlight here is Theron Humphrey's visit with Maddie on Tuesday. His strong fan based, solidified online by his blog, came out in full force for Maddie on Things, and Maddie seemed to have a very, very good time. Nice events with Mathias-Riegel in house and at the Charles Allis Art Museum for Shapiro top the list this week (signed copies of The Art Forger are available), but book clubs are also a factory. Two of our largest clubs that pick their books annually made their decisions, and both HHhH and The Yellow Birds were on their list. I'm currently reading The Chaperone, which we'll be discussing for our in-store lit group on Monday, August 5. I spoke to one of our regular attendees who devoured the book and is very excited about the discussion. Simon Sinek was a featured speaker at the Northwestern Mutual's sales conference. His book Start with Why suggests solving business problems based on answering the question why, instead of what or even how (though a sales rep recently told me that they had two books called How and Why, and the former well outsold the latter). Hey, if everyone agreed, we wouldn't have pundits. Sinek made waves with a very popular TED talk. If you thought the release of adult titles slowed down in the summer, that's even more the case for kids' books. That said, Jasper Fforde's The Last Dragonslayer came out in paperback and it placed just below our top five. This is the first book in his acclaimed new book series, and he's coming to Milwaukee for his second tile, The Song of the Quarkbeast. Mr. Fforde will be appearing at the Cudahy Family Library on Wednesday, September 11, 6:30 pm. In the Journal Sentinel, Jim Higgins talks up Loteria, a novel about Luz, making sense of her grief, who is inspired by the cards in this traditional Mexican game. He notes "they're not instruments of divination like tarot cards, but, like the tarot deck, the simple, traditional design of the Lotería cards gives them a touch of the archetypal." Carole E. Barrowman tackles Stephen Kiernan's The Curiosity, a Frankenstein like novel about a scientist who finds a dead man on an Arctic expedition and successfully reanimates him. "When this 'metabolic mystery' is re-animated successfully, the Lazarus Project quickly moves from a science lab to the world's stage." Barrowman calls this a measured and thought-provoking alternative to summer reading. Also thanks to Mr. Higgins for reporting on the Man Booker longlist. Right now, the store seems to favor Colum McCann's TransAtlantic, but we'll see if several booksellers get behind some of the titles that are coming out Stateside in the fall. 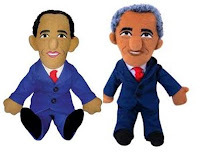 Saturday Gift Post--TeNeues Cards, A New Obama Plush, Dinosaur Pens. It's one week after the gift show and while nothing from the show itself has arrived (I actually placed seven orders there), several shipments did arrive at Boswell. 1. 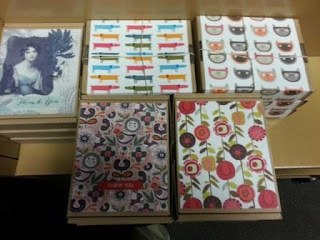 The seasonal TeNeues boxed card order arrived. They have been experimenting a lot with recycled cardboard packaging. It must be working because it seemed like more than half the new releases for boxed cards were in the green notes category. 2. 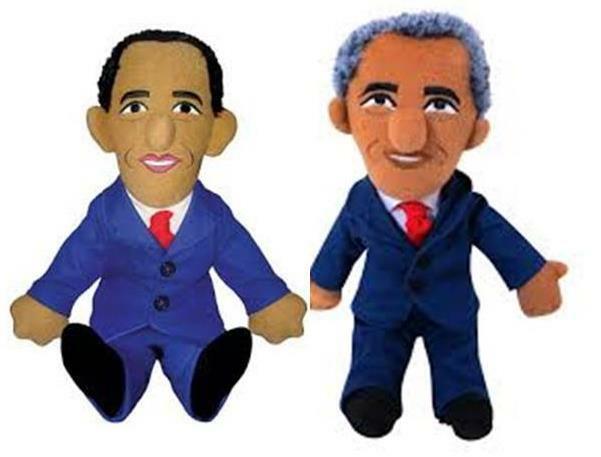 Unemployed Philosophers Guild shipped a President Obama Little Thinker backorder. Nick noticed that the new Obamas have gray hair. 3. We're so sad that Halley is moving in August, but I'm glad to say that we brought in dinosaur pens for her to ooh and ah over while she's still here. 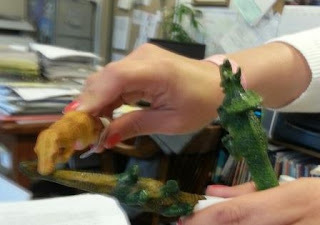 It's a cautionary tale of when dinosaur pens attack. The August Indie Next Flier is Here--Four Authors are Coming and Another is Recommended by Our Own Nick. When Barbara Shapiro was speaking at the Charles Allis Art Museum on Wednesday, she mentioned that it's so hard for writers to break out. At one point on her NYT bestseller run for The Art Forger (signed paperbacks available), she noticed that she was the only author on the list who'd never before hit the list. I mentioned how much indie booksellers try to support new writers, and this list is a clear indication of that. Of the twenty, I can only think of two writers, Michael Paterniti and Philip Caputo, who have had previous bestselling titles. Caveat--authors who are established stars rarely have a July to early August on sale which would warrant an August Indie Next Pick. As a control, I reached back to April, a month that would be considered a traditionally good new release month for a high profile author. In that case, there are bigger names, but fewer than half of them have had previous titles that could be classified as bestsellers. Andrea Thalasinos is coming to Boswell, along with Susanna Daniel, on Tuesday, August 20, 7 pm. Toby Barlow is coming to Boswell on Wednesday, August 21, 7 pm. Yes, the airport store group Hudson Booksellers is part of the ABA. One year I went with a bunch of them on a High Line walk at Book Expo in New York. You can't actually visit Sarah and ask for more of her picks, as she works in the offices. Not all their stores are at airports, by the way. They have a store at the train depot at Citicorp Center in Chicago. I've linked to the map. And on Wednesday, August 28, 7 pm, we have a double bill of Indie Next picks. We had booked Janice Clark for that day, based on a great recommendation from our own Mel, and when Amy Gail Hansen came along, and her rec was positioned right next to Clark's on the flier, and both of the books in a way played off of literary classics (it's not clear on review below, but Hansen's novel has a "madwoman in the attic" theme running through it), it just seemed like a great match. Thanks to Kathleen, Sarah, Karen and Bill for those recs. Hope you'll try one of our Indie bookstore approved events in August, and if you like hard copy, we've got plenty of copies of the August flier at Boswell (and if you are reading this outside the Milwaukee area, the fliers are likely at your favorite local indie bookstore too). 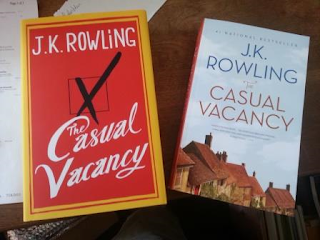 The Boswell Detective Hour--Investigating Another J.K. Rowling Mystery. In all the hubbub about The Cuckoo's Calling, there's been an interesting detail that hasn't been talked about very much.And why is nobody talking about it? Well, honestly I think it's because nobody really cares. That said, we at Boswell find it fascinating. 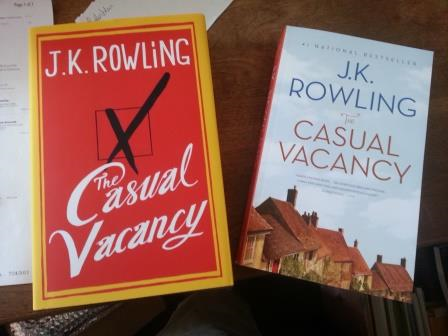 The paperback edition of The Casual Vacancy, while sporting a different cover, is most likely a paperback rebind of the hardcover edition. While once a frequent occurrence (at least one of my old time reps used to point these out to me as I bought the frontlist), I think nowadays this is a rarer thing. Even in books with a lot of hardcovers left over, the hardcovers are remaindered or pulped, and a completely new paperback is created. Here are some hints as to why we think Rowling's book is a rebind. 1. There's an endpaper in the same rust color as the hardcover. 2. The Library of Congress page does not list the paperback edition. We looked at several other titles and they all had updated copyright or printing info. 3. The typeface is the same size. More on that later. There's really only one actual downside to this. The inner margin is a little small. I think regarding every other factor, this is a complete win for paperback readers. And regarding the margin, I've seen smaller margins on originals from time to time. 1. The typeface is the same size. Most of the time the paperback typeface, even for trade titles (as opposed to rack sized mass markets) are smaller. 3. I'm not expert, but I suspect that it is ecologically better to rebind than to pulp and recreate. I guess there's one psychological downside. It implies that the sales were disappointing enough that copies were left over. So in one sense, I feel a bit guilty for calling this out, but in another, I think it's a really great revival of an old practice. Or maybe it's a policy that never went away amongst large publishers and I wasn't aware of it. Have you discovered paperback rebinds? Let us know about them in the comments area. One Rec for Something that's Been Around For A While, Another for A Book So New They Barely Sold it To Us Yet, Plus Some Book Club Selections. Last week I wrote about trying to find new in paperback African American fiction for our book club brochure. This quest actually led to two displays, as not only did I come up with two recommendations, but I decided to play off the Milwaukee Art Museum's 30 Americans (now through September 8) with a table display of 30 American Writers. I tried to keep to the parameters of the exhibit and only feature writers from the last thirty years, and tried to focus a bit on less well known names. In addition, we found two interesting books for our book club brochure. Stacie suggested Marie NDiaye's Three Strong Women, and while the author was not American, it piqued my interest enough to add it to the book club table and select it as our October in-store lit group selection. We'll be meeting to discuss this Prix Goncourt winner on Monday, October 7, 7 pm. As an aside, Anne just told me that the mystery group will be reading George Peleacanos as their September selection. The title they chose is Down by the River Where the Dead Men Go, one of his Nick Stefanos novels. They meet on Monday, September 23 and they welcome all Pelecanos fans or fan wannabes to their meeting. Our event with George Pelecanos is Thursday, October 17. Back to the book club. I said I wound up reading Martha Southgate's The Taste of Salt,but I don't think I included my staff rec, beyond the one sentence taste in Friday's list of book club picks. "Josie (as in Josephine Baker) Henderson is a marine biologist at the facility on the coast of Massachusetts. She’s left her family behind in Cleveland—a hardworking mom, a long-time alcoholic father in recovery, and a little brother, Tick (as in Edmund Spenser, long story) who’s following in his father’s footsteps. She’s long estranged from her father, but when her brother needs her to pick her up in recovery, her carefully wound life, including a marriage to her white husband Daniel, begins to spiral downward, especially when a fellow Black scientist arrives at the clinic. Southgate tells the story from several perspectives, but there’s never any question that this is Josie’s story, a meaty tale that ponders just how much we can learn from the mistakes of ourselves and our families." So no sooner was I done with this project than Mel sent me this wonderful rec for a new African American memoir. The book was in the fall PGW catalog so we had to move it to a backlist order, as it's already available. Five New Novels About China (and One About Singapore, Which I Just Learned on Wikipedia is 74% Ethnic Chinese). This morning I went to Jason and said, "It's Tuesday. What's new this week?" and he replied, "Pretty much nothing." It's the dregs of summer and August*has one of the smallest release schedule of the year. I went up to our front cases and browsed both the Boswell's Best and New and Noteworthy hardcover case and saw that there were a good number of books by Chinese authors. I've already written up Crazy Rich Asians on the blog, and since then, I've met a couple of folks who've read and enjoyed it. Just to get a feel for what we're talking about, Plum Sykes called it a "Chinese Dallas meets Pride and Prejudice." Kwan is from Singapore, and since the majority of Singapore residents are ethnic Chinese, I am guessing that he qualifies. Here's an interesting interview with Kwan from the blog Read it Forward, where he discusses his design background and consumerist culture. It's about a Chinese American girl who travels to Singapore to meet her new boyfriend's family, only to find out they are wealthy beyond all get out. Tash Aw's Five Star Billionaire is said to be a contemporary novel that captures the vibrancy of China today, particularly Shanghai. The author is originally from Taiwan, was brought up in Malaysia, and now lives in London. The story focuses on a factory girl, a country boy turned pop star, a real estate developer, and a leftist turned businesswoman, and the billionaire himself, pulling the strings on the characters with his various schemes and secrets. The novelist Aminatta Forna review the novel for the Guardian, and says "Aw is a master storyteller and Five Star Billionaire can be read as The Way We Live Now for our times, for with the global triumph of capitalism, New York and London pale in comparison with the financial behemoth of Shanghai." Moving away from big city riches, Ma Jian's The Dark Road, this novel is about a peasant family who decide to have a second child when their first child is a daughter. On the run from the law, they decide to sail down the Yangtze River in a rickety houseboat. The Dark Road wears its politics on its sleeve--the jacket copy talks about the women he met to research the book, said to undergo abortions and forced sterlization in the name of the one child policy. Ma Jian is another Londoner, who lives with his translator, Flora Drew. In the Washington Post, Carolyn See notes that "As an argument against the one-child policy and the horrific conditions it has spawned, The Dark Road is very effective. But that polemical animus also works against its success as a novel." Columbia University Press has a new book out called The Matchmaker, The Apprentice, and The Football Fan, written by Zhu Wen and translatted by Julia Lovell. Like Ma Jian's work, it's political in nature. Kirkus Reviews notes "at odds with the Chinese regime's reigning ideology of the late '80s and the '90s, which appears determined to crush its citizens' individuality." The (Minneapolis) Star Tibune's Tom Zelman calls the collection "funny, complex, fantastic and true." I think the book is one of the more attractive packages I've seen of late--a decent paper weight, colored endpapers, a nice design on the jacket, but I'm not a fan of the tiny type and very tight letter spacing. Definitely a paper-saving move. Moving on to mysteries, there's a new Inspector Chen novel by St. Louis's Qui Xiaolong called Enigma of China. Back in the day, we did quite well with the author's first few mysteries, including Death of a Red Heroine and A Loyal Character Dancer. The newest features Inspector Chen (a poet by training, a police inspector in Shanghai by occupation) investigating the death of Zhou Keng, the son of a major party member who himself was ousted from a plum position after corruption was exposed. His death has been ruled a suicide but it doesn't add up. The Wall Street Journal's unnamed reviewer (how unusual!) thought the new book was excellent. As it is written, "Inspector Chen, the poetry-writing detective featured in Qiu Xiaolong's outstanding series of procedural novels set in contemporary Shanghai, knows not to take people, or cases, at face value: What seems simple on the surface may soon reveal subtle, even fatal aspects." According to my sister, the book to read is The Hour of the Rat, by Lisa Brackmann. Claudia, as you know, teaches Chinese at Holy Cross, is the former president of the Chinese Language Teacher's Association, and has written a number of bestselling Chinese textbooks, as well as probably the bestselling and best reviewed Chinese grammar book out there. Do I sound biased? I tend to share some of my advance copies with her, as she is an enthusiastic reader who shares good feedback, and boy, did she love this book. It follows an army vet turned art dealer, Ellie McEnroe, who is the agent for an Ai Weiwei-style dissident artist. The police (one of whom is an old boyfriend) are on her trail for her connection to the dissident. And her other case, trying to help an army vet trace his brother, seems to be angering a lot of folks as well. The more she disgs, the more trouble she gets into, but McEnroe is dogged in her pursuit of justice. And why not? The alternative is hanging out with her mom. I asked Claudia why she loved the book so much and she had two reasons. First of all, this book is very unusual in that its very fair to China and really delves into the complexities of modern life there. It's neither an attack on nor a love affair with the culture. It's neither wonderful nor terrible, just a really interesting place where almost anything can happen. And Ellie McEnroe is a really great protagonist--funny and smart and open, without being obnoxious or pretentious. Lisa Brackmann (pictured) has won at least one China specialist's heart,and based on how many other folks my sister talks to in the field, more fans are likely to come. *I don't know what "August is July" meant either. I think I was trying to say that new titles releasing in July have been rare since the days of the Scribners, Putnams, and Doubledays vacationing at their summer retreats. Monday Event Post--Cathleen Schine Tonight, Maddie the Coonhound Tomorrow, Then B.A. Shapiro at the Charles Allis Art Museumon Wednesday, and Finally Barbara Mathias-Riegel at Boswell on Friday. Here's what's going on this week at Boswell and environs. It feels like I've been writing about this day for months, and I guess, in truth, I have, what with our email newsletter, several blogs, beloved entreaties. Ths is is my ilast chance to entreat you to come to see a charismatic author who has written a charming and surprisingly moving book about a makeshift family in 1960s New York. 1. The Miami Herald had an on-point review of Fin and Lady from Connie Ogle, which was reprinted in the Journal Sentinel. JS doesn't buy the web rights to their wire service reviews, so I've linked to it directly. Ogle ogles the sweet sixties setting: "The real star of Fin and Lady is that romantic time and place, Greenwich Village in the 1960s, where the Chicken Kiev at the Russian Tea Room melts in your mouth, the sounds of Pete Seeger and Woody Guthrie waft from the windows..."
2. Anthony Domestico in The San Francisco Chronicle calls Schine's latest "an enchanting novel about enchanting things," though he didn't like the way the novel shifted in the end. I actually thought it was completely appropriate and gave the book a bit of gravitas. Plus I don't mind getting a little weepy. The story is recounted as a tale, after all, and tales play with your emotions. 3. Since her new novel is particularly New Yorky, her column in The Daily Beast is about her favorite New York books. Sure, she includes The Age of Innocence, but how about Rex Stout's Some Buried Caesar? 4. I cannot get the ampersands to work on blogger of late. Has anyone else noted that? As you go back and forth from compose mode to HTML mode, the ampersand gets stuck in its html code "&" when you are in compose mode." It's a bummer, man. 5. Here's Schine at Politics and Prose, talking about dealing with an editor who didn't understand her sense of humor. Theron Humphry and Maddie, author and subject of Maddie on Things. One of the things to know about Maddie and Things is that the book started out as a completely different project. Per his publisher, he decided to take a trip across America to meet, photograph and tell the story of one person each day. For company, he brought along his sweet-natured rescue Coonhound, Maddie. “I figured if Steinbeck had Charley by his side on his American travels, I needed a good dog next to me in my truck,” he said. While Theron pursued his ambitious plan, he also took photos of Maddie whose mellow nature and uncanny sense of balance made for surprising and captivating photos. Theron shared the resulting images via Instagram and Tumblr to the delight of a rapidly growing group of followers and media outlets like Good Morning America, Wired, Time, and People. And now he's traveling the country again, but this time Maddie is the star. The "National Geographic Traveler of the Year"is coming with Maddie to Boswell. Maddie has over a quarter of a million followers on social media, and several of them are Boswell booksellers. Here's a little more about Theron and Maddie on the Today Show web page. Thanks to the publisher for this additional picture. B.A. Shapiro, author of The Art Forger. Admission to this event is $5, which will go directly to the Charles Allis. Claire makes her living reproducing famous works of art for a popular online retailer. Desperate to improve her situation, she lets herself be lured into a Faustian bargain with a powerful gallery owner. She agrees to forge a painting—one of the Degas masterpieces stolen from the Gardner Museum—in exchange for a one-woman show in his renowned gallery. When the long-missing Degas painting—the one that had been hanging for one hundred years at the Gardner—is delivered to Claire's studio, she begins to suspect that it may itself be a forgery. Claire's search for the truth about the painting's origins leads her into a labyrinth of deceit where secrets hidden since the late nineteenth century may be the only evidence that can now save her life. Shapiro's novel has become a major New York Times bestseller. Here are some of the reasons. Kathryn Lang in The Boston Globe found the novel "inventive and entertaining" but called it misleading to be categorize The Art Forger as a literary thriller, but the newspaper later named it one of the best crime novels of the year. Stephan Lee in Entertainment Weekly said "she's done meticulous research and has such interesting things to say about authenticity — in both art and love — that her novel The Art Forger becomes not just emotionally involving but addictive." Here's more about the book from the trailer, which the publisher created for the hardcover edition. Barbara Mathias-Riegel, author of Curtain Calls. With all the changes in publishing, many authors are utilizing new technologies in order to produce their creative works. One of these changes is the Espresso Machine—a digital device that prints and binds books, on demand—and only a handful of independent bookstores around the nation have one. At Politics and Prose in Washington D.C., they offer publishing services to area authors, and Barbara Mathias-Riegel is the first author we are hosting to have printed her work in this fashion. Originally from Wisconsin, Mathias-Riegel’s first collection of short stories, Curtain Calls, explores the nuances of love, loss, aloneness and self-discovery. Men and women, young and old; they struggle with the tragic occurrences and unveiling of secrets that are part and parcel of life with our loved ones. While the characters in these twelve stories are often affected indirectly by what is happening to those they care about most, their own frailties and memories rise like ghosts, haunting them in ways that bring the darkness others are bearing, more directly into their own lives. Craig Wilson, author of A Little More Line: A Kite's Eye View of Wisconsin and Beyond. “This new book is sure to make new converts as well as delight the many longtime fans of his remarkable art.” —Doug Moe, Wisconsin State Journal. Hope to see you at an event this week. Saturday Gift Post--New Cards and Giftwrap.